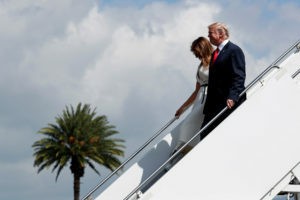 HONOLULU — On his most grueling and consequential trip abroad, President Donald Trump stands ready to exhort Asian allies and rivals on the need to counter the dangers posed by North Korea’s nuclear threat. The 12-day, five-country trip, the longest Far East itinerary for a president in a generation, comes at a precarious moment for Trump. Just days ago, his former campaign chairman was indicted and another adviser pleaded guilty as part of an investigation into possible collusion between his 2016 campaign and Russian officials. With Trump set to arrive Sunday in Japan, the trip presents a crucial international test for a president looking to reassure Asian allies worried that his inward-looking “America First” agenda could cede power in the region to China. They also are rattled by his bellicose rhetoric about North Korean leader Kim Jong Un. The North’s growing missile arsenal threatens the capitals Trump will visit. Trump’s spontaneous, and at time reckless, style flies in the face of the generations-old traditions and protocol that govern diplomatic exchanges in Asia. Trump’s spontaneous, and at time reckless, style flies in the face of the generations-old traditions and protocol that govern diplomatic exchanges in Asia. The grand receptions expected for him in Tokyo, Seoul, Beijing and beyond are sure to be lavish attempts to impress the president, who raved about the extravagances shown him on earlier visits to Saudi Arabia and France. Trump may also have the chance for a second private audience with Russian President Vladimir Putin, on the sidelines of a summit in Vietnam. The White House is signaling that Trump will push American economic interests in the region, but the North Korean threat is expected to dominate the trip. One of Trump’s two major speeches will come before the National Assembly in Seoul. Fiery threats against the North could resonate differently than they do from the distance of Washington. Trump will forgo a trip to the Demilitarized Zone, the stark border between North and South Korea. All U.S. presidents except one since Ronald Reagan have visited the DMZ in a sign of solidarity with Seoul. The White House contends that Trump’s commitment to South Korea is already crystal clear, as evidenced by his war of words with Kim and his threats to deliver “fire and fury” to North Korea if it does not stop threatening American allies. At each stop, Trump will urge his hosts to squeeze North Korea by stopping trading with the North and sending home North Korean citizens working abroad. That includes China, which competes with the U.S. for influence in the region and provides much of North Korea’s economic lifeblood. The White House is banking on the close relationships Trump has established with some Asian leaders to help make his demands more palatable. Officials acknowledge that Trump does not yet have a feel for Moon Jae-in, South Korea’s newly elected liberal president. But Trump has demonstrated cordial relations with Xi and struck up a friendship with Japanese Prime Minister Shinzo Abe, with whom he planned to golf on Sunday. While Xi and Abe have recently tightened their control on power, Trump arrives weakened by low poll numbers, a stalled domestic agenda and the swirling Russia probe. Many in the Asian capitals will view Trump warily. His early withdrawal from the Trans-Pacific Partnership demolished the Obama administration’s effort to boost trade with some of the world’s fastest-growing economies and sustain America’s post-World War II strategic commitment to Asia. Trump is expected to outline his economic vision for the region, which includes a preference for one-to-one relationships over multinational agreements, during a speech at a summit in Vietnam. He is not expected to offer any concrete economic policy changes while in Asia, though some new contracts for American businesses may be announced. His administration’s eager embrace of a deeper strategic partnership with India and other democracies across the Pacific risks alienating China and Pakistan. The White House did, at the last minute, extend the trip for an extra day so Trump could attend the East Asia Summit in the Philippines. At the same time, Trump can point to some early successes in Asia. He won Beijing’s support for the toughest international sanctions yet on North Korea. Tensions in the disputed South China Sea that escalated as China conducted a massive land-reclamation effort on Obama’s watch have ebbed. Long-standing U.S. alliances with Thailand and the Philippines have been repaired by engaging their authoritarian leaders and sidelining human rights concerns, though the White House suggested Trump may chide Duterte privately. “How much does it help to yell about these problems?” McMaster said. Trump’s trip will be the longest Asia visit for any U.S. president since George H.W. Bush went there in 1992, when he fell ill during a state dinner with the Japanese prime minister. Associated Press writers Jill Colvin and Matthew Pennington in Washington contributed to this report.